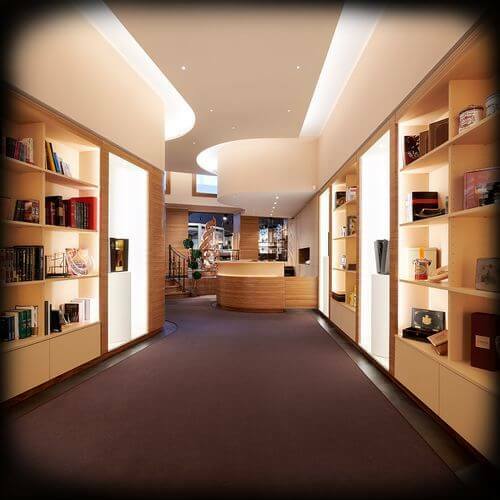 HOUSE OF GRAUER Geneva hosts a 600 m2 shop dedicated to cigar lovers. Europe's largest walk-in humidor has an unrivalled choice of the most sought-after cigars. The place you are looking for truly exists. The House of Grauer opens its doors to you and reveals its secrets. Enter and embark on a journey to discover cigars from the finest plantations and factories, imbued with History and legends. Just like the cigars we leave to age and therefore developing rich aromas. Once you enter the premises, time will be paused thus inviting you on a gustatory and cultural voyage. To enhance your pleasure and turn every visit into an epicurean treat, we source and select the finest coffees, teas, chocolates, liqueurs and vintage wines. This approach reflects our desire to combine the skills of cigar makers with those of artisans, winemakers and pickers in a uniquely pleasurable experience. While paying the same attention to detail when selecting the world's finest cigars, The House of Grauer has worked with highly skilled craftsmen to design and furnish a selective space dedicated to cigars. Located in Geneva's business district, this unique place adds an element of discovery to the pleasure of smoking. With its passion for a lifestyle that cultivates the refinement of the senses and emotions, The House of Grauer has created a special place far removed from the bustle of everyday life. A haven of peace; a place to reconnect with oneself. Somewhere to take time out, alone or with others, while appreciating premium cigars, vintage wines and prestigious liqueurs as well as skillfully made artefacts. In this space dedicated to authentic pleasures, The House of Grauer aspires to make every moment memorable, through simple luxury that allows you to become master of your own desires.